Suitable for one cat. May also be suitable for 2 small cats or 2 older cats. Each Condo has its own screened window. The windows are Low E ensuring that the outside temperatures will not affect Kitty’s comfort. 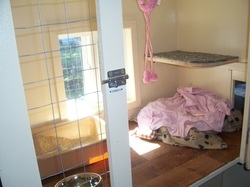 There is also a perch and a carpet scratcher as well as comfy bedding and toys. This accommodation will happily suit a family of 3-4 cats. It is also suitable for those very active cats who want to have room to roam. Two individual condo’s combine to provide your feline friends separate spaces for sleeping, playing and eating as well as double perches and windows. This arrangement also works well when you have one kitty in a family that has different dietary needs from everyone else as they can have a separate space for meals. Patio Condo’s are purrfect for those kitties wanting private access to the outdoors. As well as having an indoor condo section, patio condo’s have exactly that—a covered, enclosed patio perfect for being outside and enjoying the fresh air. Bird watchers especially love these condo's. This doubles your kitty's space. The Family Condo is purrfect for active cats, climbers or families. There are many different levels for perching and sleeping and an extra large window for outdoor viewing.